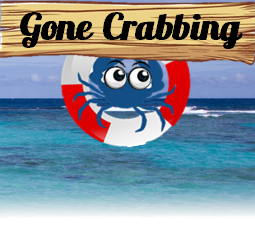 If you bought or caught live crabs, you’ll need to consider cleaning your crab first before making some of those delicious crab recipes you have been reading about as crabs aren’t known to be clean creatures. But the questions remains how do we clean a live crab? Cleaning a live crab could be a little daunting as well as downright scary to some beginners. Those big claws are intimidating, and also you know how painful it will likely be if they get hold. Try wearing some gloves providing you with some confidence to get going. You’ll need a household scrubbing brush ideally using the handle on the top; it will make it easy for you to hold and allowing you to get a more vertical force. The crab will try staying upright and threaten you with those claws, so ideally obtain the crab right into a sink or tub facing from you and obtain the water running through it. You need to push firmly around the outer shell with one of your palms to keep it down as crabs are extremely strong no matter their size. With your spare hand grab the brush and begin scrubbing the carapace very hard under flowing water. This can get rid of the accumulated grime and also at the same time result in the crab almost dizzy, so keep scrubbing hard until the back is clean and consequently there really should not be any movement from the legs or claws indicating that you have stunned it just a little. It’s going to be easier to flip them over and clean underneath. Give its body and legs an additional good scrubbing, while still being prepared for that crab to snap from its trance unexpectedly. The crab will be ready to cook when you have rinsed it off with water, so grab a pan or pot and add about five to six quarts of water. Add 1 cup of sea salt to produce a seawater simulation, or add seawater if convenient. When you heat the water up to 100 degrees, it will make the crab sleep gently. After a couple of minutes of performing this, crank the crab around the heat until it simmer and cook the crab for approximately 8 minutes for the first 1lb of weight, then about 6 minutes for the next 1lb after which cook for approximately 5 minutes for each 1lb. Remove the crab, drain off the water and plunge it into a sink or pan containing some iced water. Let it cool for a couple of minutes, drain off and transfer it to a plate into the refrigerator before you’re ready to cook it. This procedure provides you with lovely moist crab meat. This method is perfect if you want to use the crab meat later to use in various recipes like crab cakes or salads. For preparing for recipes in which you will be eating the crab with the shell, see the next method of cleaning. Once you’ve sedated your crab, you need a knife (or some type of shucking tool), flowing water, a place to put the clean crabs and a huge trash bin. Follow these steps to wash the live crab. Take the knife and put it into the opening in which the apron was previously and take away the shell from the crab and put it in the trash bag. While rinsing under flowing water, take away the dead gills and then any guts which were left within the crab, being careful not to remove any from the white flesh/meat. 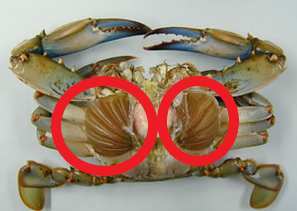 The gills are circled in red below. Usually, the face from the crab can come off using the shell but when not be sure to take away the crabs face too. Do the last rinse under water and place clean crabs inside a bowl and keep it aside. Now your crab is clean you can plan when to cook it.